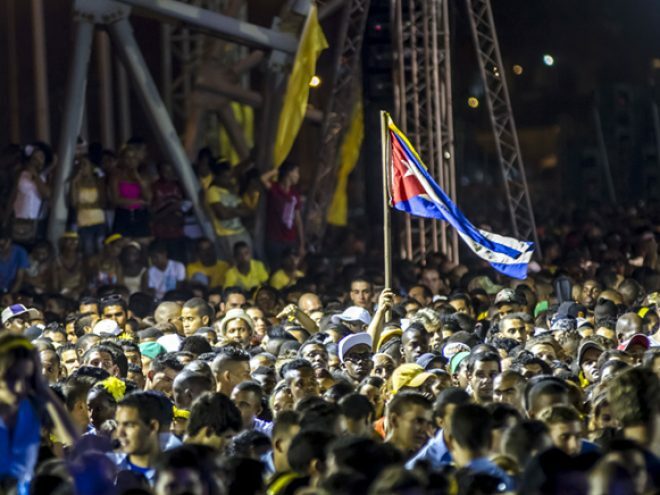 In the evening over 40 Cuban soloists and bands met at the Tribuna Antimperialista in front of the US interest section. And the yellow ribbons were tied not only “round the ole oak tree,” as the 1973 song says, but round wrists, foreheads, guitars, necks, balloons, columns and even flags. The solemnity of Schubert’s Ave María, in a version for piano by Frank Fernández, gave no hint whatsoever as to what would follow–a marathon of performers, who, perhaps unwittingly, offered a live panorama (technical problems included) of present-day Cuban music, not very coherent at times, yet unbiased and wide-ranging. The eternal trova, the melancholic bolero, street hip-hop, jazz, pop, electronic music, timba, fusion… were all heard and enjoyed in the voices and instruments of artists who rarely meet on the same stage. Austere Silvio Rodríguez and colorful Juana Bacallao; Amaury Pérez and Adversario; gentle Liuba María Hevia and El Yonky, who really took wearing yellow to heart; Elito Revé who gave his blessing left and right, and the Anacaonas, so restrained; the orishas of the Yoruba pantheon and the folk songs of the Cuban countryside; the always sober and precise National Choir and Kva Libre, bursting with enthusiasm; reggaeton singer Baby Lores, who is up to new more trova-like music; the explosive Ángeles, that make the girls go wild. The show closed with none other than the “locomotive of Cuban music”, Juan Formell’s Van Van, who made a practically exhausted crowd dance to their hearts content. “What a way to protest against an injustice,” some could say. But they don’t know that, like their ancestors from Africa, Cubans accompany their happiest, more intimate and fondest moments with music.